Häggund’s corps (IV C) repelled an enemy offensive at the Kollaa River and in Kitilä. After this, the corps launched a series of counterattacks in the Kitilä area. These counterattacks were not yet successful in cutting off the enemy’s rear routes in December, but they did succeed in stopping an attack by an enemy rifle corps (56th RC) for good. front for the IV Corps. By holding the defensive line at the Kollaa River, the corps protected its encirclement attacks on the east side of Kitilä (Kitelya). In the area near Lake Ladoga that was defended by Hannuksela’s division (13th D), an enemy division (18th RD) attacking north from the direction of Käsnäselkä (Kyasnyaselkya) forced the Finns to abandon their main defensive position at the Uuksunjoki (Uksunyoki) River on 4 December and retreat to the Uomaa area. On 5 December, the corps (IV C) gave Hannuksela’s division the right to withdraw from its main defensive position to new defensive positions in the Kitilä–Syskyjärvi (Syuskyuyarvi) area if necessary. The retreat took place in the directions of both roads on 11 December. The vanguards of the enemy divisions reached the IV Corps’ new defensive position in the small hours of 12 December. With their attacks, the enemy forces succeeded in achieving small breaches of the Kitilä–Syskyjärvi defensive line. The situation was stabilised with local counterattacks. A rifle division (18th RD) of the enemy that attacked along the Käsnäselkä road tried to advance north immediately after reaching the west side of Lemetti. The units in Hannuksela’s division (13th D) started counteroffensives to Ruhtinaanmäki, carrying out a total of three. Some of them were related to the encirclement attacks by Häggund’s corps. However, the enemy retained control of Ruhtinaanmäki for the time being. Hägglund’s corps (IV C) launched two counteroffensives further down the Käsnäselkä–Lemetti road in 1939. The first of the attacks started immediately on 12 December and the second on 26 December. The IV Corps was unable to block the road, but the attacking rifle division (18th RD) was forced to tie one of its rifle regiments to the protection of its rear routes. Hannuksela’s division (13th D) moved to a defensive position in its area on 19 December, after the first counterattacks. 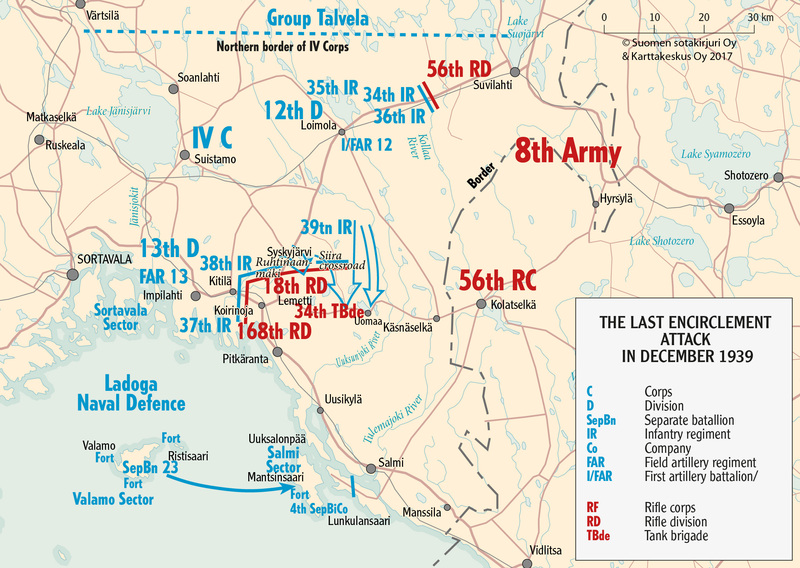 On 24 December, the IV Corps ordered its divisions to prepare for a new counterattack. The aim of the attack was to defeat the troops of the enemy rifle division (18th RD) deployed in the Ruhtinaanmäki–Lemetti area. 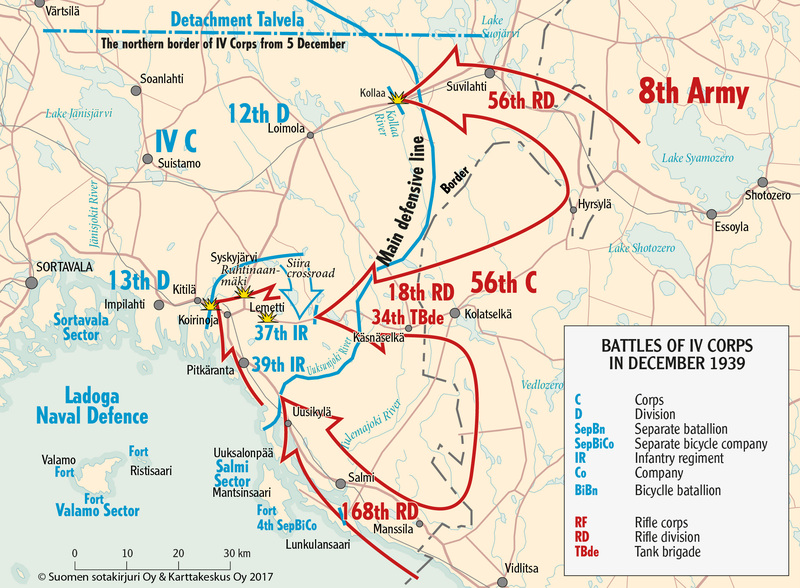 In the first stage, the units in the Kitilä area (13th D) were to cut off the enemy division’s (18th RD) supply routes to the east by taking control of the road leading to Käsnäselkä in the area around the Siira crossroads. 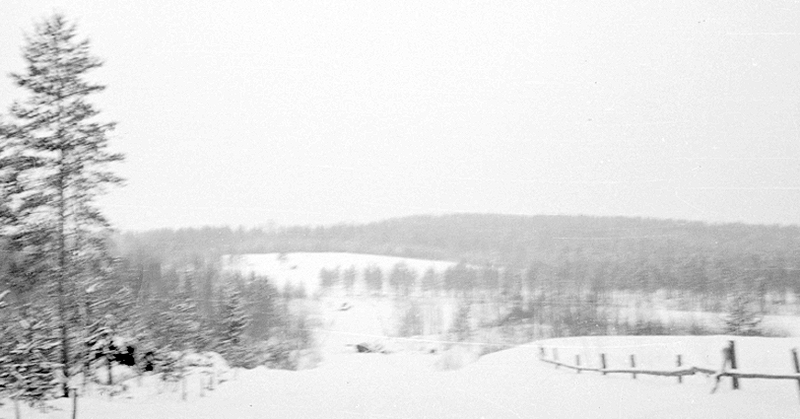 Tiainen’s division (12th D), which fought in the area of the Kollaa River, was to participate in the attack by Hannuksela’s division by sending approximately a battalion of troops to take part in an attack in Uomaa. The target of this attack from the north was the field logistics units of the enemy forces in Käsnäselkä. Hannuksela’s division (13th D) was to also launch an attack on Ruhtinaanmäki in the second stage and advance south from there. The assault troops of the first stage successfully advanced to the Käsnäselkä road in the area around the Siira crossroads. The attack cut off the supply road of the 18th Rifle Division to the west for good. Farther east, the enemy’s protection detachments prevented the Finnish battalion from advancing to the village of Uomaa. The attacking troops disrupted the enemy’s transport operations on the Uomaa–Käsnäselkä road. Open fields in Ruhtinaanmäki. SA-kuva. In the west, the second stage offensive only succeeded in advancing on both sides of Ruhtinaanmäki. The offensive in this area was aborted on 29 December, but the offensive to capture Ruhtinaanmäki continued until 3 January. The same day, the detachments that had disrupted the traffic on the Käsnäselkä road also broke away from their positions. Hägglund’s corps (IV C) started to assemble the forces for a new counterattack. The Salmi sector of the Ladoga Naval Defence had coastal fortifications on the islands of Lake Ladoga, at the flank of the rifle division (168th RD) that attacked along the Salmi–Kitilä road. The Mantsinsaari Fort in particular was able to significantly disrupt the division’s transport operations with both artillery fire and its infantry patrols. In December, the 23rd Separate Battalion (23rd SepBn) had been transported from Valamo (Valaam) over the ice to the Mantsinsaari Fort. This increased the fortification’s infantry strength. After the withdrawal of Hannuksela’s division, the fort’s separate bicycle company (4th SepBiCo) started sending patrols to interfere with the enemy’s transport operations on the road travelling along the shore of Lake Ladoga. The fort’s troops occupied the north end of Lunkulansaari Island on 20 December. At the end of December, the troops of the Mantsinsaari Fort also occupied a part of the Uuksalonpää Cape of the island and set up a forward observation site at the tip of the cape. The two 152 mm coastal guns of the Mantsinsaari Fort kept shelling the enemy’s transport units on the shore road throughout December.